A book full of fascinating maps to arouse your curiosity. A Make/100 project. 228 backers pledged €16,483 to help bring this project to life. In my work as a map designer and science writer, I have collected over the past two decades hundreds of curious stories related to cartography or geography. These stories have seen the light of day in the form of hundreds of articles in magazines and blogs, as well as in posters or maps of very diverse types. Now, I've decided to compile my best maps and lesser-known but interesting curiosities from all that material I've collected over the years. The result is this book, an atlas designed to awaken your curiosity. The thematic maps that I have selected are part of the ones that I have created in the last years, improving them and adapting them for this book. I am currently taking the last steps in the elaboration of the model for printing and in the writing of the final contents. The momentum that Kickstarter can provide to this project will make a difference. So, first of all, thank you very much for your support! Alejandro Polanco Masa (@alpoma), the author. Did you know that attempts were made to build two canals in Central America to compete with the Panama Canal and that, in one of them, they wanted to transport large vessels inland by means of gigantic railroads? In the Pacific Ocean there is an island where a large part of the population is unable to perceive colors. Another Pacific island maintained for centuries an economic system based on the use of large stone disks as coins. On the coasts of Namibia, large factory ships could be used to drain huge quantities of diamonds from the seabed, just as it is being studied to do with the immense quantities of metal nodules from the bottom of the oceans. There are places in the seas of our planet that, at night, are illuminated with phosphorescent lights thanks to the activity of certain biological species. One could walk, without interruption and in a straight line, from West Africa to the end of China (crossing a bridge that exists over the Suez Canal). During the twentieth century, before the advent of GPS technology, many different types of gadgets were used to guide cars. Did you know that by 1920 automobiles could have navigators and photographic guides to navigate? At the beginning of the 16th century, a cartographer drew a map of the Earth that, by chance, is very similar to the most recent gravity maps. Did you know that for centuries it was thought that California was an island, or that there were gigantic mountain ranges in West Africa, or that in the interior of Australia a great sea could be located? These are just some of the more than 500 curiosities described in the book. Have I managed to arouse your curiosity? 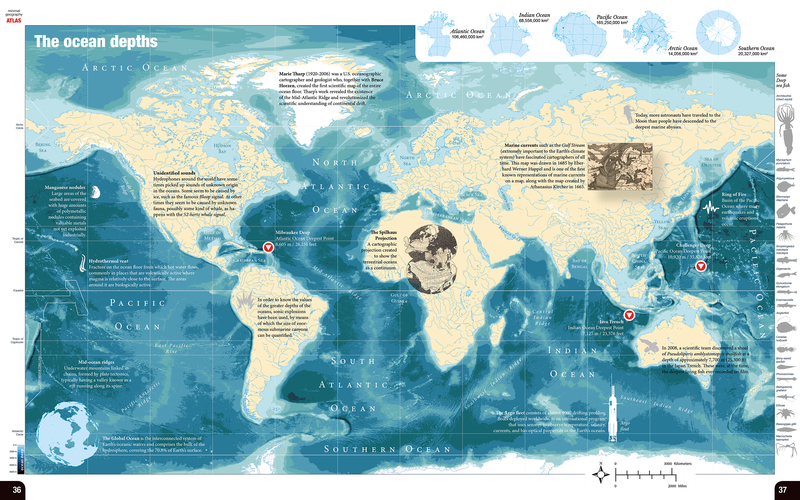 The contents of the atlas are distributed along thematic maps with double page layout. 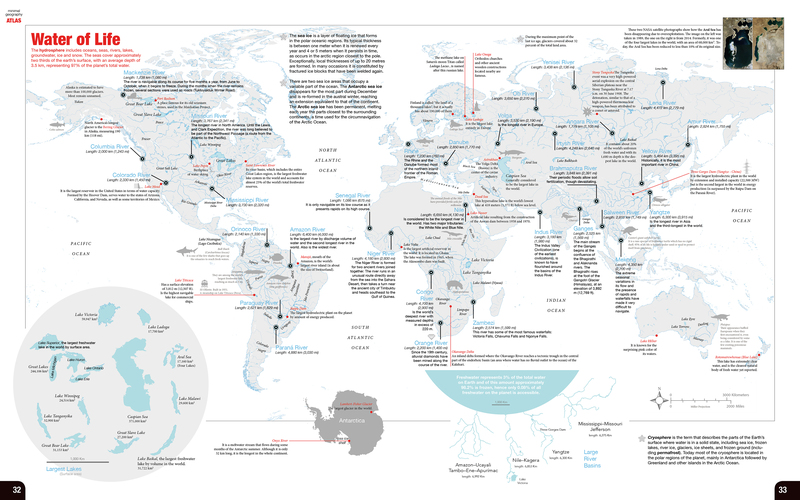 Each map is complemented with dozens of small notes on geographical curiosities. When stories require more space, they are distributed along longer texts on the margins. The final contents are currently in the final stages of development, prior to the first printing proofs to check the final quality. Below are images of the content of the project, as they are currently. As the final content creation process progresses, new images and detail will be added. Example of a double-page map. (Pages 32-33). FEBRUARY 2019: Content review and printing proofs. MARCH 2019: Final printing proofs. APRIL 2019: Sending of rewards. REWARD #1: Digital version of the Atlas. High-quality PDF, to screen view or print. Digital download. REWARD #2: Printed version of the Atlas. Softcover edition. Includes downloadable digital version in PDF. REWARD #3 (Limited to 100 units): Special Edition of the Atlas, printed in hardcover, signed and numbered. Includes downloadable digital version in PDF. There are no special risks beyond those typical of a publishing project of this kind. After having participated in the edition of several dozen books, there is enough experience to keep the process under control. However, unexpected delays in delivery times can occur. Any delays or incidents will be properly reported. Digital version of the Atlas. High-quality PDF, to screen view or print. Digital download. Printed version of the Atlas. Softcover edition. Includes downloadable digital version in PDF. Special Edition of the Atlas, printed in hardcover, signed and numbered. Includes downloadable digital version in PDF. Limited to 100 units.